So apparently the installation of GPS equipment to track buses stop-by-stop in realtime hasn’t helped Myki zone detection at all. On Tuesday at lunchtime I caught a bus from Queensbridge Street (aka Casino East, the brand new tram/bus platform stop) to Queen Street. It’s all within 1 kilometre of the city centre — about as far from zone 2 as you can get. And it’s on a route with realtime information, so at least some of the equipment in the bus knows almost precisely where it is. So, what happened? Myki charged me for a zone 2 fare. It thought I was in Brighton, in the zone overlap area. It seems to have got the route number right. “out” indicates it thought it was an outbound trip, though given it’s a crosstown route, I have no idea that’s correct or not. Perhaps they should have different indicators for crosstown routes, such as “se”/”nw”? The silver lining is that the zone 1 fare cap meant I was charged the correct amount for the day’s travel: a total of $7.52. 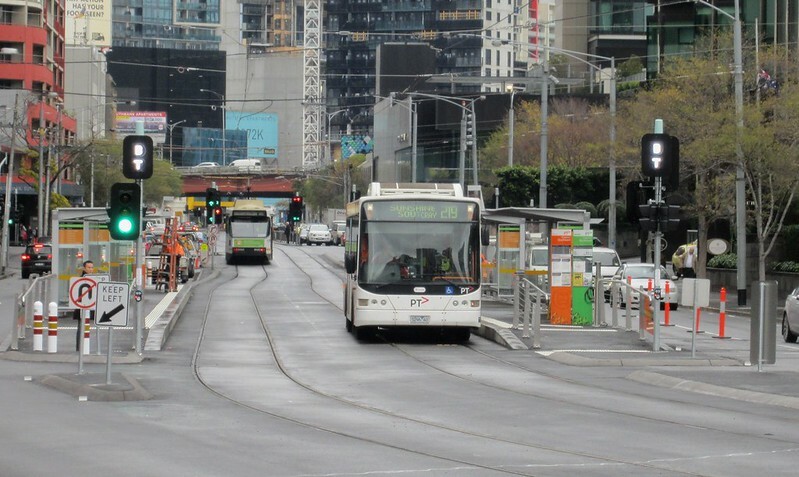 Zone detection on buses (and trams) has been a problem for years, and it’s only the zone changes in January that have hidden the issue for Melbourne users, but it remains a problem on regional town buses — there are regular reports of overcharging. Clearly it’s is something they still need to work on. Oh, and the new platform stop? Nice, though some of the bus drivers seem a little uncertain about how close to the platform edge they should stop. The bus/tram lanes seem quite effective at helping them get past the traffic. And I wonder if, when commissioned, the realtime screens there will show bus as well as tram? ← Previous Previous post: Sense8’s public transport. Can you name the cities? I bet if you phoned myki and complained, you’d be told that Queensbridge St is in Brighton. And also that you were charged a cheaper fare, so what’s the problem? On the Transdev real-time information, I’ve found it extremely useless because it is very unreliable. I was waiting for a bus at Fisherman’s Bend the other day, it indicated it was coming soon. It counted down and went without any bus appearing. Checking the app further down the street, the bus had disappeared and the next one was listed as coming in an hour, despite another bus meant to be in between. The bus arrived 15 minutes later, with the app still saying the next one was due in 45 minutes. On Johnston St, it’s not so bad, but the time jumps all around the place. They have a lot of fixing to do. @Roger, I have better things to do than ring Myki! I wasn’t really charged a cheaper fare, because I was later charged the difference. However, as I noted, there have been problems for regional town bus users. Geelong for instance is in multiple zones. @Campbell, perhaps it’s patchy, or individual buses have problems. I’ve found it pretty good based on my limited use. Either the buses have problems or the drivers don’t set the route correctly. Clearly the bus you were on Daniel still thought it was at the beginning of the route on Brighton. Just type up a description of your situation, click submit, and you’ll get an email a few days later stating the outcome. No more hold music on the phone, and you can save time by copy and pasting your problem each time it happens! Arh, true incompentence is in charge of the system. Just like the timeout feature after 2 hours. I was not blocked getting out at Southern Cross station yesterday because I touched on too soon at Waurn Ponds. The train from Warnambool turned up for the next up. I flatly refuse to use the Warnambool train for trips between Melbourne and Geelong including Waurn ponds. You only have one carriage, and it is meant to cater to the same demand as a 6 car V/Locity, as well as all those who travel beyond Geelong too. So, I had to wait for the next V/Locity, and got blocked getting out at Southern Cross station. Recently, PTV banned people getting on inbound Vline trains at Pakenham and Sunbry, but at the same time they make the Warnabool train collect passengers all the way into Deer park.